Click here for more stories by Evie Manieri. 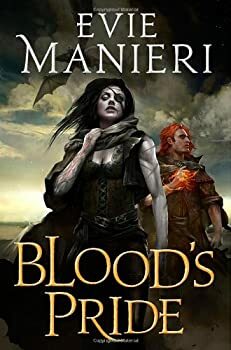 Blood’s Pride is a debut fantasy from Eve Manieri that unfortunately reads not so much like a first novel, with all the usual attendant issues of a first novel, but more like an early draft of a first novel. There’s the very strong opening scene that one could see perhaps sparking the whole idea, a few intriguing “what if one character did this to another character” plot points to create both internal and external conflicts at the outset, and several neat background ideas concepts with regard to mythology or world-building. But the execution just isn’t fully there — sometimes failing due to a lack (say, of clear, precise settings) and sometimes failing due to an excess (too many of those complicating plot points).